If you followed my tank setup guide you may now be ready to add fish to your tank. Don’t just rush to the store and buy all the fish that look nice – you need a plan and a sensible shopping list. There are a few key decisions that you have to make at the start of this process. You need to decide which species of fish you are going to have in your tank and how many of them you’ll introduce. This can get tricky fast and you absolutely should never buy any species of fish that you have not done any research on! Each fish species has it’s own special considerations and some fish species can’t live with each other at all. Fish are also not particularly picky about what they eat – a big specialized algae-eater may not eat another smaller fish, but in general a fish will eat another fish if it will fit in its mouth. Smaller fish may be able to outswim bigger fish, but if they have nowhere to hide the constant stress can kill them. In fact, stress is one of the biggest things you want to try and avoid when it comes to your fish, and I’ll talk about it throughout this piece. When choosing fish at the store, try to pick ones that look healthy and full of life, with good color. The healthier the fish are when you buy them, the better the chance that nothing goes wrong. How many fish can you use to stock your tank? That can be a tricky question that depends on a number of factors. 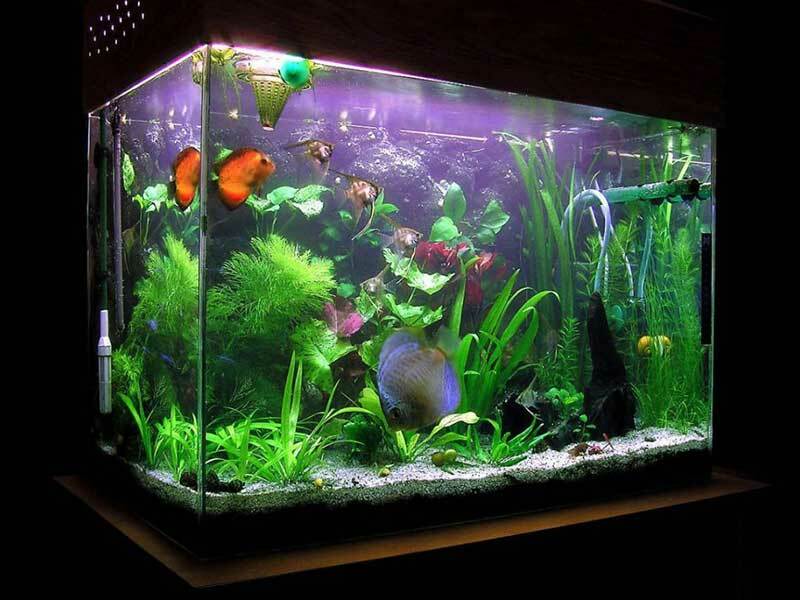 There is a widely-used rule of thumb that says for each gallon of aquarium water you can have one inch of fish. This rule applies more to smaller fish such as tetras, but it is a good place to start. This means that in a typical 20 gallon tank that a beginner might choose, you can have 20 one-inch fish. This should leave enough water to let each fish get enough oxygen and to accommodate the bacteria and waste product each fish makes. Not all fish are created equal, however; big fish may be more wasteful per-inch than small fish. They may be messier eaters or poop more. It’s also not just about the gallon capacity of the tank. Oxygen enters the water at the surface; the larger the surface area of the water, the more oxygen can be exchanged there. Bubblers, for example, don’t put air in the water directly, but the surface agitation speeds up oxygen exchange. So a rectangular 20-gallon tank can move more oxygen than a 20-gallon portrait tank that’s deeper, but has a smaller surface area. In addition to this, the warmer the water the lower its oxygen capacity. You can find many online calculators that will help you determine how many fish you can stock your tank with safely. You can, of course, purposefully overstock your tank, but this is an advanced practice that involves building better filtration and tightly monitoring and controlling water parameters. I would not recommend attempting to overstock as someone just starting out. Also, please take note not just of how big a fish is, but how large it is likely to grow. If the fish you buy are not fully grown, treat your capacity calculations as if they have become fully grown. Also, resist the urge to have lots of single fish in order to provide variety. Many species of fish need enough numbers to form a school. This is behavior meant to ward of predation; if certain fish species can’t school they’ll be stressed out all the time, making them more prone to disease and sudden death. So you’ve gone to the pet store, bought your fish and want to bring them home. How do we safely complete this journey? 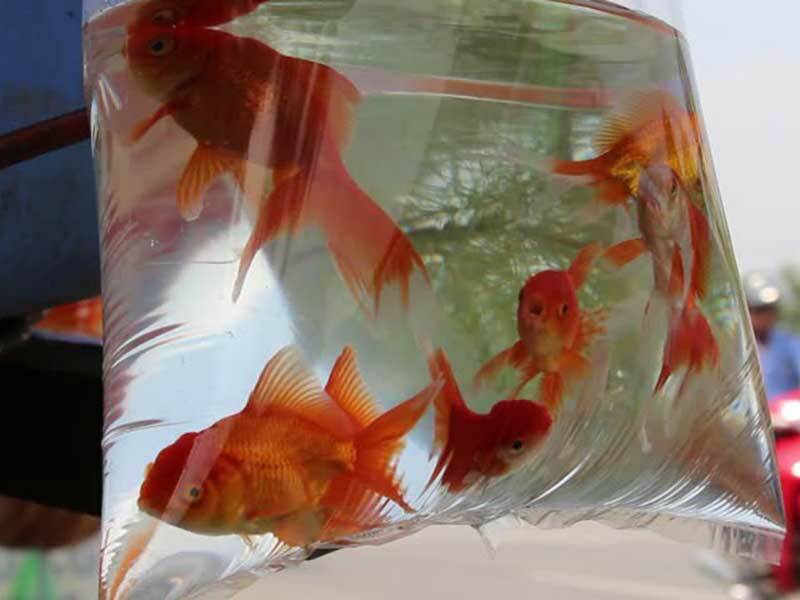 A good pet store will give you your fish in clear plastic bags partially filled with water, inflated the rest of the way with air, and tied off tightly with a rubber band. You should put these clear bags into something that block light, such as a box or opaque bag. Why? We don’t want the fish to see light and motion, which is something that will stress them out. Transporting them in the dark is the best way to do this. Also, don’t leave them in your car while you do something else, or you may very quickly find that the inside of your car has become so hot that your new fish have died before making it home. Make your fish purchase the last thing on your to-do list and drive straight home with them. Even if you do everything right and take the best care, your fish are likely to lose some color and liveliness as a result of the stress of transport. A day or two in your tank will sort them out right quick. When you get home, don’t just dump the new fish into your tank. You need to acclimatize them to your tank’s water and other conditions. Sudden temperature changes can stress or outright kill fish, so taking it slow is the best approach. Take the rubber band off the bag and roll it up like a sock to just above the waterline in the bag. Place the bag into the surface of the water so that it floats in your tank. This lets the fish get used to the look of your tank, it lets the temperature difference slowly equalize, and it let’s you get the fish used to the new water chemistry. How do we do that last part? Well, after the water in the bag and in the tank seem to be more or less the same temperature, take a cup or scoop and put a little of the tank water into the bag. DO NOT let any water from the bag you got at the pet shop get into your tank. This is how you introduce new diseases into your water and you don’t want that, believe me. You want to add enough water to the bag so that the total amount of water is double. In other words you want to match their water with your water so that the mix is essentially 50/50. After about twenty minutes or so, gently net the fish in the bag and free them into your tank. Once you have done this for all your new fish, carefully remove the floating bags without spilling any foreign water in your tank. If all is well you shouldn’t need to do anything more than this, but keep an eye on your new fish for the next few days. If any of them look sick, it may be a good idea to remove them from the tank to a quarantine tank – a second small tank that is used to isolate sick fish that could be contagious. Also keep an eye out for aggressive behavior between fish. Some fish species can be very territorial. This can usually be solved by giving fish more ornaments to hide in or adding more of the same species so that some fish don’t feel as threatened. If you don’t notice any problems in the first day or two, you are probably good to go. Now you should just proceed with normal maintenance. Check the water quality often, do regular water changes, and so on. 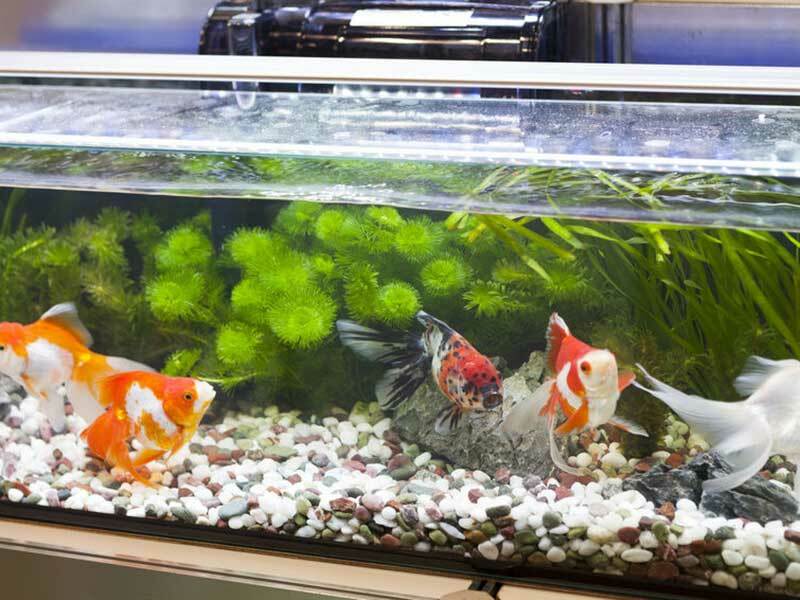 I have another article describing general aquarium maintenance you can have a look at HERE.